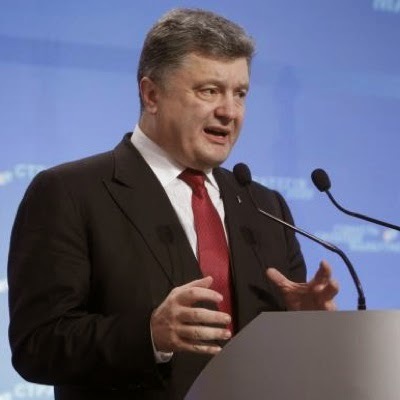 KIEV, Ukraine -- Ukraine's President Petro Poroshenko said he would present a broad plan of social and economic reforms on Thursday which would allow the former Soviet republic to apply for membership of the European Union in six years. Ukraine's President Petro Poroshenko speaks to the media during a news conference in Kiev, September 25, 2014. Ukraine's parliament ratified a landmark agreement on closer ties with the EU on Sept. 16, though implementation of the trade part of the accord has been delayed until January 2016 to appease Russia, which says the pact will hurt its markets. Poroshenko, speaking to Ukrainian judges, also said that for the first time in many months no deaths or wounded had been reported in the past 24 hours in a conflict with pro-Russian separatists in eastern Ukraine, indicating that a ceasefire struck on Sept. 5 "has finally begun working". "I will present my vision of Ukraine's development, our strategy for the period up to 2020," Poroshenko said, referring to a news conference set for later on Thursday. "It (the strategy) provides for 60 separate reforms and special programmes, which will prepare Ukraine for applying for membership in the European Union in six years time," he said. Poroshenko is trying to keep his strife-torn country on a course of European integration despite fierce opposition from Russia, which Kiev and its Western backers say has armed and backed the separatists in mainly Russian-speaking eastern Ukraine in a conflict that has killed more than 3,500 people. Russia is also fiercely opposed to Ukraine, a nation of some 46 million people, ever joining NATO. Both the 28-nation EU and NATO have said they have no plans to offer membership to Kiev. Ukraine agreed to the ceasefire after big battlefield losses by government forces which Kiev ascribed to Russian forces joining the fray on the side of separatists. Moscow denies sending its forces into Ukraine or arming the rebels, despite what Kiev and the West say is incontrovertible proof. Ukrainian and foreign analysts say Kiev needs to carry out deep-rooted and effective political and economic reforms to overcome years of inefficient and corrupt governance to make the country eligible for EU membership. Malpractice reached a peak under Poroshenko's Moscow-backed predecessor Viktor Yanukovich. After Yanukovich fled to Russia in February in the face of mass street protests, Moscow denounced a pro-Western "coup" against him, annexed Ukraine's Crimean peninsula and subsequently backed the armed separatists in the heavily industrialised east in their drive for independence from Kiev. The United States and the European Union have imposed economic sanctions against Russia and Moscow has retaliated with its own measures.